Action Beats Reaction is a fairly simple principle to understand and apply. If two people are within reach of one another, in a stationary position, the one who moves first wins. Learn how to use Action Beats Reaction to your advantage. Following is a drill that illustrates the Action Beats Reaction principle quite well. Partner A holds a finger less than 3 inches from the chest of Partner B and demonstrates that they can easily touch Partner B without hindrance at full speed. Partner B holds an arm out to the side several feet away from Partner A’s hand but that is clearly visible to Partner A. Partner B gets to move first and has to traverse several feet to get to Partner A’s hand. As soon as Partner A can tell that Partner B is moving they touch Partner B’s chest as fast as they can. Partner A’ hand only has to travel 3 inches. Partner B’s hand has to travel several feet but Partner B gets to act first. Partner A only gets to react. If I am Partner B I only move when Partner A is standing still. It would seem that Partner A still has the advantage since they only have to move 3 inches but the vast majority of the time Partner B will win the contest and if Partner B moves well and when Partner A is least ready and most still then most of the time Partner A will not move at all. Several feet to several inches is quite a contrast and illustrates why the Action Beats Reaction principle is so important to understand and apply. 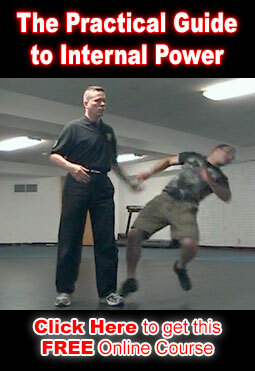 In a self defense situation where you are already within reach Action Beats Reaction is a very important principle to know and apply because it can truly give you a serious advantage even when you start out at quite a disadvantage. If I stick my finger in a would be attacker’s eye before he even realizes I have moved then he is already hurt and I am on my way to my next move by the time he is responding. You can imagine the surprise and disorientation that the person who is playing catchup is feeling because they were caught before they could respond. Although this does not guarantee victory it certainly lends itself heavily to it. Part of the reason that Action Beats Reaction works is that for most people it takes the mind the better part of half a second or longer to realize what has happened in a situation. In the jungle this principle is fairly simple to apply. Strike first with lethal intent. Kill or be Killed. But, for self defense in America Action Beats Reaction must be used differently in order to follow the law of our civilized society as opposed to the law of the jungle. Responding to every situation with a strike first and kill or be killed manner will eventually cause you to be incarcerated without parole. In most places in the civilized world there is a civic duty to avoid conflict when possible and although the law allows for self defense it does not allow the defender to be aggressively proactively offensive. Essentially and unfortunately, the criminal gets the opportunity to attack us first and then we can respond in order for most self defense to be legal. In a real self defense situation this actually causes Action Beats Reaction to work against the law abiding person and makes it what I call the Action Beats Reaction Problem. In my next post I will post our Clear’s Silat basic solution to this problem and how to legally use Action Beats Reaction for self defense. There is also some very nice video footage of our solution and approach to this problem on our Self Defense Tactics for the street video. 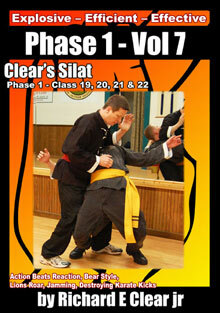 Our approach to the self defense legal reality on American streets is really the primary difference between Clear’s Silat as it is practiced in the United States and Silat as it is practiced in its true form in the jungles from which it originates.